WE APOLOGIZE; HOWEVER DUE TO PERSONAL CIRCUMSTANCES WE ARE ONLY ABLE TO OFFER CRUISE SHIP TOURS (BOOKED THROUGH THE CRUISE SHIP) AND CHARTERS; FOR THE FORESEEABLE FUTURE. FOR ALL CHARTER BOOKINGS, PLEASE CONTACT US. THANK YOU. Enjoy an excellent town tour of Broome, complete with expert live commentary provided by the owner operator ; one of Broome's most experienced tour guides. Offering a professional, high quality relaxed tour of this beautiful Pearling town, this will be one of the most informative tours you will ever go on; guaranteed! 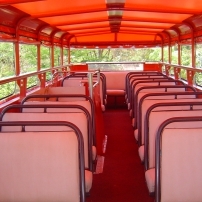 The touring vehicle is a Leyland Double Decker bus which has been beautifully restored and offers comfortable seating with unique views and photographic opportunities from the shaded top deck of the bus. For ALL TOUR INFORMATION please open the 'Tour Information' tab. commented on "We have attained a 'fully accredited' status, awarded by the Australian Toursim Council. ..."
commented on "SOME OF OUR PASSENGER COMMENTS: ..."